A blue carbon conference, hosted by Counterpart International, will take place at Washington D.C. tomorrow, Friday 12th, 2012. 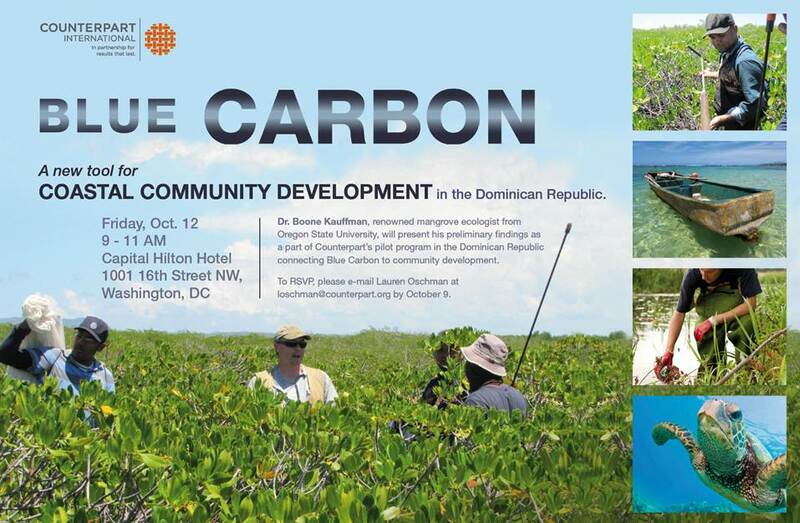 Distinguished ecologist and professor from Oregon State University Dr. Boone Kauffman will present the preliminary findings based on a recent research trip to the Dominican Republic. Kauffman is the author of newly approved market standards for blue carbon, which will open the door for increased private investment in wetland restoration and conservation projects through the issuance of internationally recognized carbon credits. Blue carbon is a natural process by which marine plants capture carbon emissions from the atmosphere and store it for millennia in the sediment. Though mangroves and sea grasses are among the most carbon-rich sites in the world, they are also some of the fastest disappearing ecosystems on the planet. WHERE: Capital Hilton Hotel, 1001 16th St, NW, Washington, D.C.